This remarkably fragrant, herb-topped soup uses a homemade beef broth perfumed with many spices. Basic preparation is simple, but there’s no getting around it — making the broth takes time. You can begin the day before and finish the soup just before serving, or begin in the morning to serve the soup in the evening. Two types of beef are served in the soup. The first, which is used to make the broth and sliced later, can be any number of different types of stewing beef or a combination. Possibilities include round steak, chuck steak, brisket, oxtail (or, in France, gîte, plat-de-côte, jarret, queue de boeuf). The second, which is finely sliced while raw and heated through at the last moment, should be a good cut of steak like sirloin tip, tenderloin, filet mignon or a tender flank steak (or, in France, filet, merlan, poire, rumsteak, bavette). Adding a marrow bone is traditional, but I find it is not necessary. As for the spices, herbs and noodles, if you have access to Asian products by all means use them, but if not you can substitute more readily available products, for example using common basil instead of Thai basil. By the way, ingredients like Vietnamese pho noodles can be purchased online these days. Go for fresh rather than dried noodles if possible. Pho can be a meal in itself. 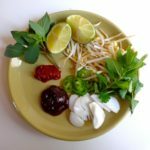 To create a lunch or dinner menu with pho as the main course, you could start with fresh or fried spring rolls or a light Asian salad and finish with mangoes. I find that this soup marries well with a crisp rosé or chilled beer. The quantities below will make four large bowls of soup. If cooking for two, I’d suggest making the full quantity of broth and freezing half of it for a later use. You can then divide the other ingredients by two. Begin making the broth at least five hours before you plan to serve the soup. Fill a large soup pot with water, add the stewing beef and bring to a boil. A layer of foam will form on top — skim it off with a spoon and discard. Reduce the heat to a simmer and add the salt, nuoc mam and sugar. Simmer for one hour, uncovered. The broth will reduce while cooking, so top it up with more water from time to time. Skim off any extra foam that forms. After an hour, add the onion, ginger, lemongrass and spices. Simmer for two hours more, keeping an eye on the pot and topping up as necessary. Turn off the heat. Remove the stewing beef to a plate and set aside. Now strain the broth through a sieve into a clean pot, discarding what’s left in the sieve. Taste the broth and adjust the seasonings, adding more salt or nuoc mam if necessary. Allow the broth and the beef to cool to room temperature, then refrigerate both for an hour or two (or more). Stage two involves getting everything ready so that you can quickly assemble the soup at the last minute. 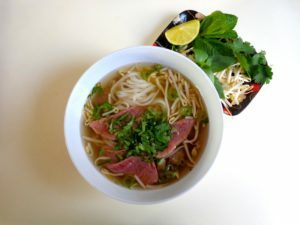 At serving time, you will layer ingredients into each soup bowl — noodles, sprouts, cooked beef, raw beef — and then pour in the broth and top with chopped onions and herbs. You also need to prepare a platter ahead of time with ingredients to be served at the table. This takes stage takes 20-30 minutes. Here is my method for efficient preparation. 1) Place the high-quality raw beef in the freezer for 5-10 minutes. This will make it easier to slice it very thinly. 2) Remove the cold broth from the fridge and skim off any fat that has formed on top. Reheat gently. 3) Remove the stewing beef from the fridge and slice it thinly. You probably won’t need all of it — the rest can be used another day in a salad or some such. 4) Slice the scallion greens into thin rings. Thinly slice the small white onions. Separate the fresh herbs (mint, cilantro and Thai basil) into two groups: leave half the sprigs whole; strip off the leaves of the other half and chop or snip finely. Quarter the limes. 5) Prepare a platter (or separate plates) with half of the sprouts, the whole sprigs of mint, cilantro and Thai basil, half of the white onion slices, the lime quarters, red or green hot peppers, hoisin sauch and hot pepper sauce. These ingredients can be added to the soup as desired by each person at the table. 6) Remove the raw beef from the freezer and slice very thinly. 7) Bring a pot of water to a boil and cook the noodles for 1-2 minutes, until just tender. Rinse them under cold water in a colander. 8) When the broth is good and hot, prepare the soup bowls. Place a mound of noodles in each bowl and top with sprouts, then the cooked beef and finally the raw beef slices. Pour in the stock and top with the chopped fresh herbs, scallion greens and the rest of the white onion slices. Serve piping hot, accompanied by the platter of extra herbs and sprouts. Serves 4. If desired, you can reheat the noodles before piling them into the bowls by placing them in a sieve and dipping it into the hot broth. You can repeat this with the cooked beef to ensure that the soup is served piping hot. However, I find this step unnecessary.